Nous avons passé de superbes vacances dans la maison de Mario au cœur de le vie sicilienne et à proximité de l’Etna. Mario a répondu à toutes nos attentes pour que notre séjour se passe le mieux possible. Un grand merci ! It was a real pleasure to have you and your family in Casa Aranci and a special thanks from Paola for taking care so well of the house and the plants on the terrace. We would love to welcome you all anytime again in the future! Thank you so much for taking the time to comment on your stay with us at Casa Aranci, Geraldine! We are glad you and your family enjoyed your meals and relax on the terrace. We hope to welcome you any time in the future! Joli appartement mais situé entre le pub le carillon et la gare. Boules Quies indispensable pour votre séjour! Hébergement très agreable et très bien équipé. Superbe terrasse avec vue sur la mer. Environnement effectivement un peu bruyant (cloches de l'église voisine- on s'habitue..!- et surtout bar sur la place, MAIS nous étions prévenus et des bouchons d'oreilles sont prevus. La mer LA plus proche est une plage de rochers, LA baignade n'est donc pas forcément très accessible pour les enfants ou les personnes âgées. Propriétaire très réactif par mail, qui nous a donné de très nombreux conseils avisés de visites et de commodités. Thank you so much for your very kind words, Claire. Your up to the point comments will help future guests to familiarise with Acireale and the area. 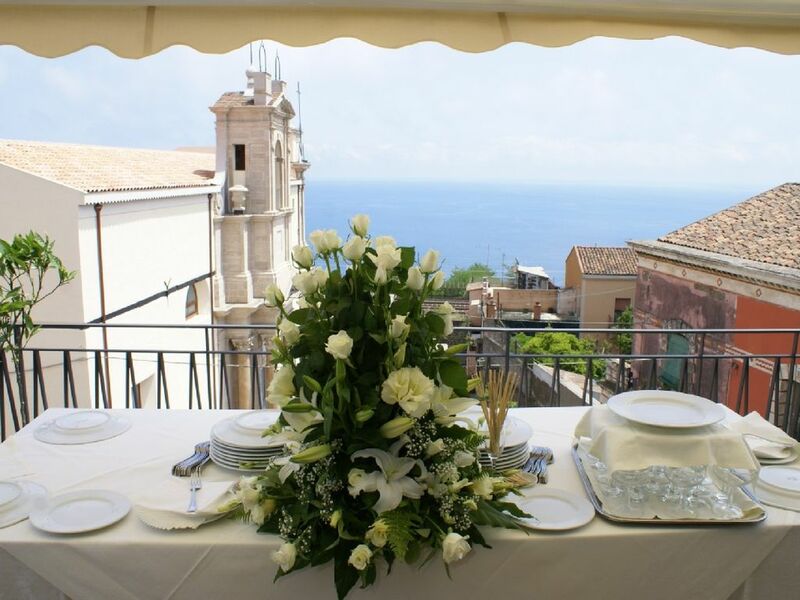 We look forward to welcome you any time you decide to visit Sicily again. Casa Aranci contains of three levels: one double room with bath on the 1st floor, two further bedrooms with another bath on the 2nd one and finally the cosy living room with kitchenet and loggia plus toilet on the 3rd. We enjoyed the wonderful view above the square with its church* onto the sea from inside and outside very much. * The bell ringer was very diligent whereas the trains and the road were fairly quiet. The pub is closeby but didn't bother during our stay -- however sensitive people could appreciate the eartips at hand. Salutatory Paola did a great Job for us: rooms, buyings, lemon and lovely flowers all around our casa -- everything was prepared for a pleasant welcome. Thank you so much Paola! Mario's tips in advance have been helpful too: that way e. g. we went on the lovely footpath 'Le Chiazette' down to Santa Maria la Scala, had a delicious dinner at Vecchia Aci trattoria, have been to Al Ficodindia as well and to Costarelli's for a tasty 'midmorning snack'. At 'The Mescan' pub we enjoyed various hamburgers amongst young people (with music and soccer on TV). Caffè Cipriani bar seems to be another good idea for a stop ... And all of them are nearby! The further hints for the preparation of our visit helped just as well. Everythink was right and highly appreciated, thanks a lot! Thank you also for taking the time to write an honest and detailed review of the house and the area. We would be delighted to welcome you any other time in the future.